Give the gift of a Syndalia Designer Bag! 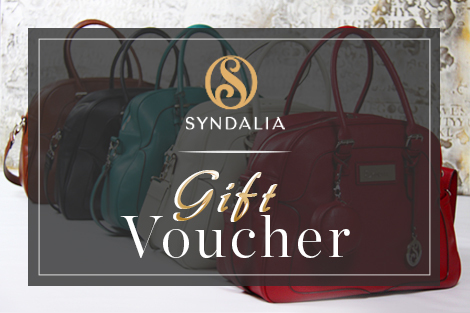 Syndalia Gift Vouchers are the perfect gift for a special friend and loved one. NOTE: Gift Vouchers are valid for 12 months from the date of purchase. 1. Gift Vouchers are valid for a maximum of 12 months from the date printed on the voucher (date of purchase). 2. Gift Vouchers have monetary value and cannot be exchanged for cash. 3. Once purchased, gift vouchers cannot be refunded or returned. 4. A credit in the form of a gift voucher will be given for un-spent parts of an original voucher to cover the balance. This credit must still be used within the original twelve-month period of the date printed on the voucher ticket. 5. Under no circumstances will gift vouchers be accepted once they have expired.